Rustic Plum Cake - Do You Know The Muffin Man? Notes: I made this cake using Ontario blue plums (Italian blue? Not sure...) that seemed a bit on the large size. Instead of a food processor, I did the whole thing by hand. Ground almonds are a staple in my freezer so I didn't have to chop the nuts with a knife. I used a pastry blender to mix up the batter, which turned out to be a thick paste. The plums were quite overcooked, and they turned pretty mushy on the top of the baked cake. 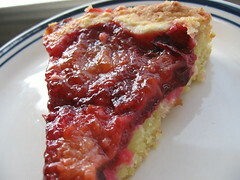 It's not too bad: mouth-puckering plums combined with a sturdy, slightly chewy, almondy cake. Not one I'd make again though.